Ceres greenhouses pair passive solar greenhouse design with an insulated greenhouse and renewable climate control. The result is a super energy efficient greenhouse that can grow abundantly and year-round with little heating or cooling. Ceres Greenhouses are designed to be integrated with a Ground to Air Heat Transfer (GAHT) system. An advanced climate battery, a GAHT system stores heat in the soil underground, providing year-round climate control using solar energy, natural thermal mass and a few small fans. Ever thought of growing your own guava, bananas or avocados? With a Ceres greenhouse you can create an abundant year-round garden right in your backyard, in any climate. We help growers customize a year round greenhouse for a huge range of climates, from Alaska to Arizona. 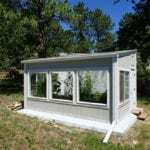 Take the guess work out of building a year round greenhouse with our standard or custom building plans. These include structural engineering from a licensed engineer, and our proven passive solar greenhouse design. Plans use wood-framing. Materials are locally-sourced and /or shipped to your home. 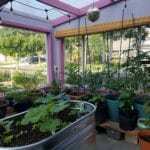 See how growers created their dream greenhouse using a book, DIY plans or a pre-fabricated kit, with some of these Ceres year round greenhouse projects. Structural Engineering: Structure and roof framing are engineered for 30 lbs / sq. ft. snow load and 130 mph wind load. How can I get an energy-efficient solar greenhouse? Our book, The Year-Round Solar Greenhouse, is a great place to start if you would like to design and build your own greenhouse from scratch. This requires some building experience, and a good bit of initiative. We can also review your design, or create a custom design for you via our consulting services. Ceres DIY engineered greenhouse plans take the guess work out of building a greenhouse. In these cases, you can use our plans – which are already engineered, designed and come with materials lists – and do the work yourself. We recommend having some experience with stick framing / standard construction methods. If you’d like to be completely hands-off, you can outsource the work to a local contractor. We strongly recommend using our pre-engineered building plans as not many contractors are familiar with greenhouse-specific materials and building methods. We recommend hiring a licensed and insured builder in your area. For select locations we can often help you find a contractor. Just contact us about your project. Standard models do not include solar panels (photovoltaic / PV systems). Solar panels can be added if you do not want to connect the greenhouse to the grid, or to provide a source of renewable energy. Please see our blog, “Integrating Solar Panels with the greenhouse” for our tips on doing this. Our greenhouses use passive solar design, making them ‘solar greenhouses’ for short. Passive solar heating is a design philosophy which aims to maximize free, passive heat from the sun, and minimize the use of fossil-fuels. Often called “solar greenhouses” for short, passive solar greenhouses can still use electricity (just as passive solar designed homes may still have everyday appliances). For more on adding electricity to the greenhouse, see our FAQ page. 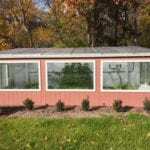 Can you help me design a custom greenhouse? Yes, we design greenhouses for a range of clients and sizes — residential, small-scale commercial, schools and institutions. We provide custom greenhouse designs, greenhouse engineering and consulting to create the perfect year-round environment you are looking for. 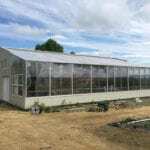 To start your greenhouse design, get in touch with us about your project. Can I have an off-grid greenhouse? Design a passive solar greenhouse. This is a structure that does not use electricity, and is inherently off-grid. Instead of electrical fans, a passive solar greenhouses uses passive vents and thermal storage methods. 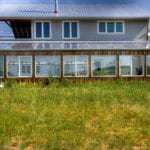 We work with people on designing passive solar greenhouses, but most of our clients add electricity to the greenhouse for greater climate control. Much more information on passive solar greenhouse design is in our book, The Year-Round Solar Greenhouse, and you can get in touch with us if this your preferred design.